A recent paper in the British Medical Journal reported that treatment with angiotensin converting enzyme (ACE) inhibitors was associated with an increased incidence of lung cancer. As scores of millions of patients take these drugs for the treatment of hypertension and related disorders, the study naturally attracted a lot of attention from the lay press. The observed effect was not very large and just achieved statistical significance – 1.6 vs 1.2 cases per 1000 person years. The comparison is between patients taking ACE inhibitors and those receiving angiotensin receptor blockers. 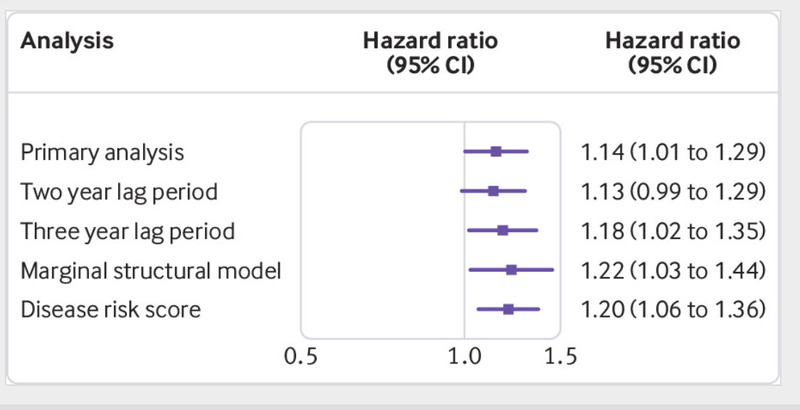 The data above show the hazard ratios for varying durations of treatment. This ratio is deemed statistically significant if its 95% confidence interval does not cross one. As you can see the primary analysis just made it. A hazard ratio like those above is probably clinically insignificant irrespective of the statistical analysis applied to them. A major problem with this study is that it contains no information about dosage. An effect of cancer development, or anything else for that matter, is likely to be dependent on the dose used – ie, the greater the dose the greater the side effect. The authors of the piece should not have had difficulty obtaining this information making its absence puzzling as well as unfortunate. This is just one observation that needs verification by other investigators. Even if true, it’s not a large enough effect to dissuade clinicians from prescribing this class of drugs as the benefits derived from their use far outweighs a small adverse effect which may not even be real. However, we should not dismiss the observation out of hand. These drugs, as mentioned, are widely used. They cause changes in bradykinin, substance P, and other compounds which could promote oncogenesis. Unlike politics, there is no free lunch in drug therapy. Caveat emptor.